It can be tough to leave a destination like Bali. Especially after 3 weeks of basking in the sun, eating glorious Balinese food, and getting massages almost daily. But the light at the end of this tunnel / holiday was looking forward to our flight back to Sydney. I thoroughly enjoyed our flight to Bali, so I was excited to see how the experience will be on this red-eye flight. It’s always busy at Denpasar Airport especially late evenings, as most flights back to Australia depart in the evening to arrive in Australia early morning. Tonight was no exception, with the expected long lines at immigration present. Boarding was about 5-10 minutes delayed, and as it was late in the evening, most people were lying on the carpeted floor, having a snooze. Despite that though, boarding was quiet and smooth. 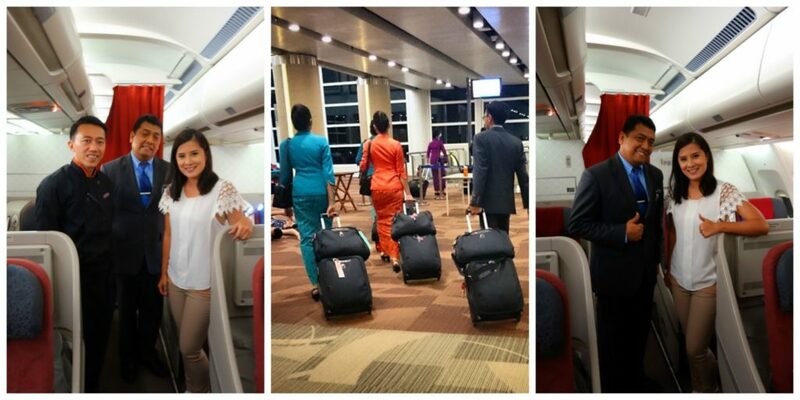 As expected with Garuda service, we were greeted very warmly by cabin crew upon entering the aircraft. I was personally led to my seat despite locating it being a no-brainer. And immediately, was given warm hand towels and refreshments. 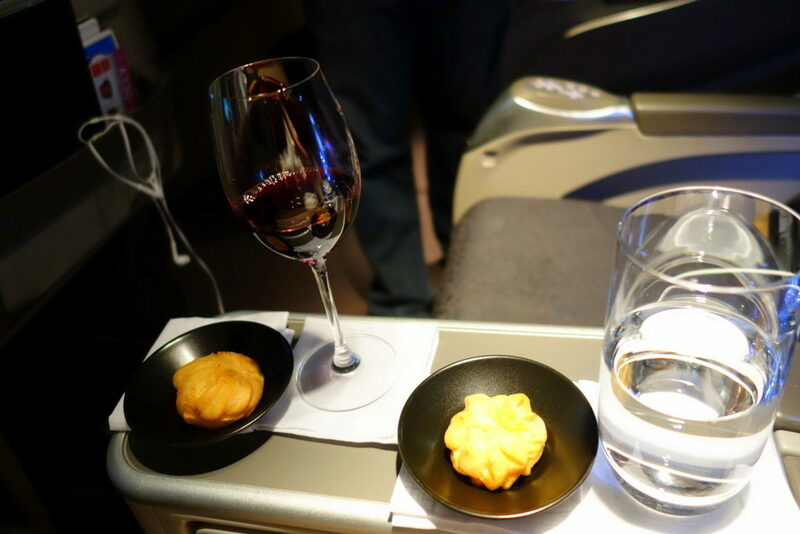 Right after takeoff, we were given cream puffs and wine. I opted for water. If you want to see all this on video, here you go. 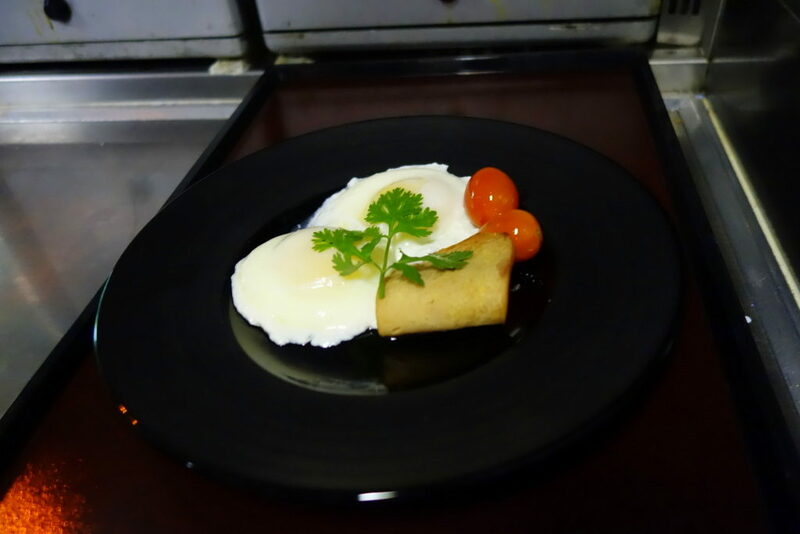 You will see Garuda Indonesia’s Chef On Board in action. But don’t forget to read further on for more details about the flight! 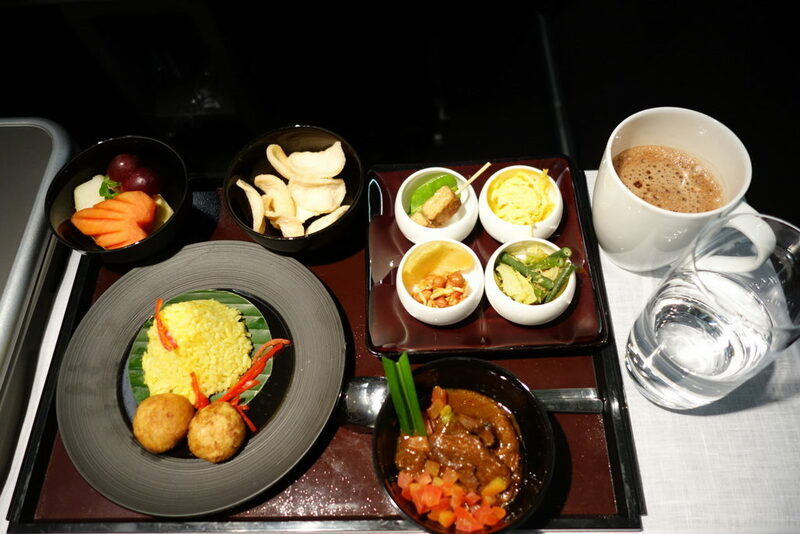 For this flight, we really enjoyed Garuda Indonesia’s “In-Between Fuel” meal selection. They are defined as “snacks for the journey ahead”. Calling them snacks (save for the nachos) is quite an understatement as you will later on see. 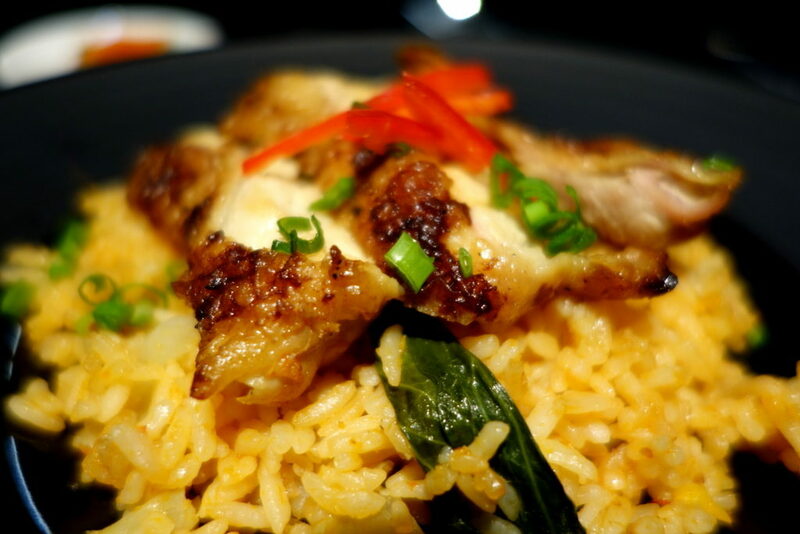 Zombie ordered the Nasi Goreng with Marinated Fried Chicken. 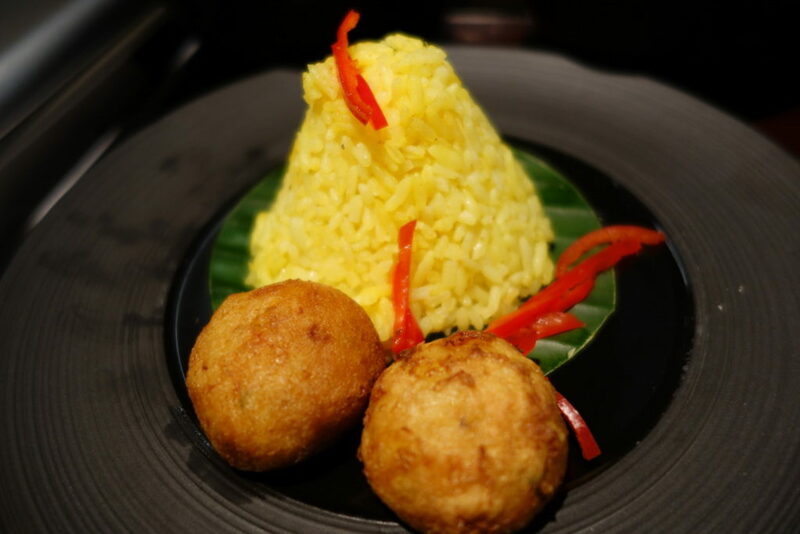 It’s absolutely a generous portion for a ‘snack’ and could very well be a meal in itself. The difference between this and an actual meal is that it does not come with appetizers or dessert or any side dish. The rice by the way was soo fragrant. It’s also been cooked with coconut oil and Zombie definitely enjoyed it. Nachos!!! The chilli dip wasn’t spicy at all, and the nachos were really fresh and warm. 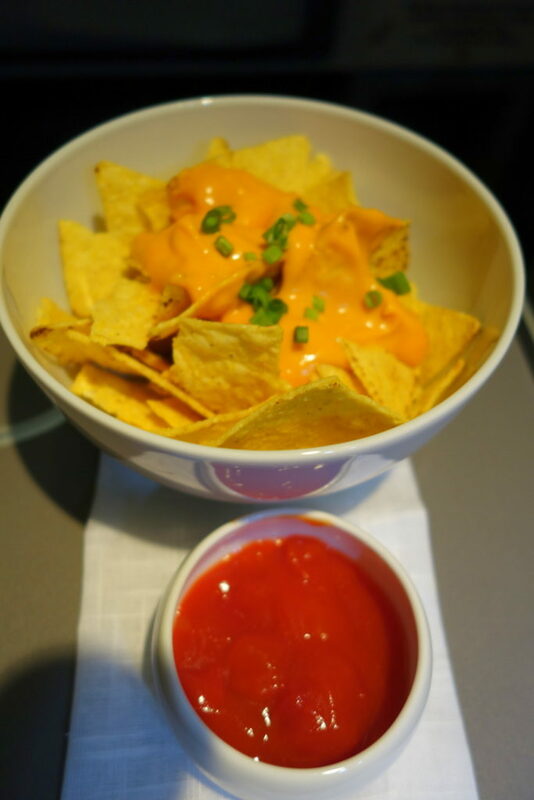 I had 2 bowls of these throughout the flight! 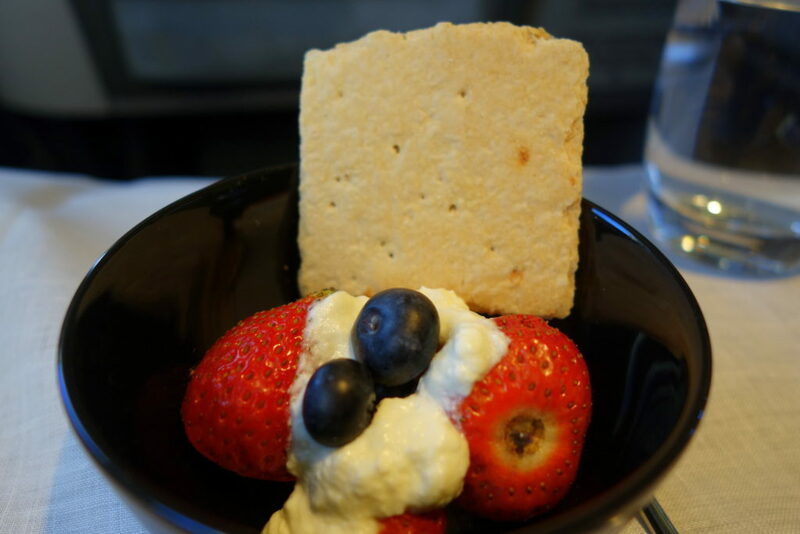 It was the perfect snack to watch in-flight movies. I didn’t finish any movie though because sleepiness was catching up with me. I just flicked through abit of this tv show and that. Seat configurations are in 2-2-2 layout. Seat pitch of 74 inches (187.9 centimetres) and width of 20.8 inches (53cm). It transforms into a comfortable 165 degree recline. I always stress that even on fully-flat beds, I never make the bed fully flat because that results in back pain and really, its quite uncomfortable to have it totally flat. This 165 degree recline is more than enough to give you comfort on a flight that’s less than 6 hours. Any more and it’s a fully flat bed you need. 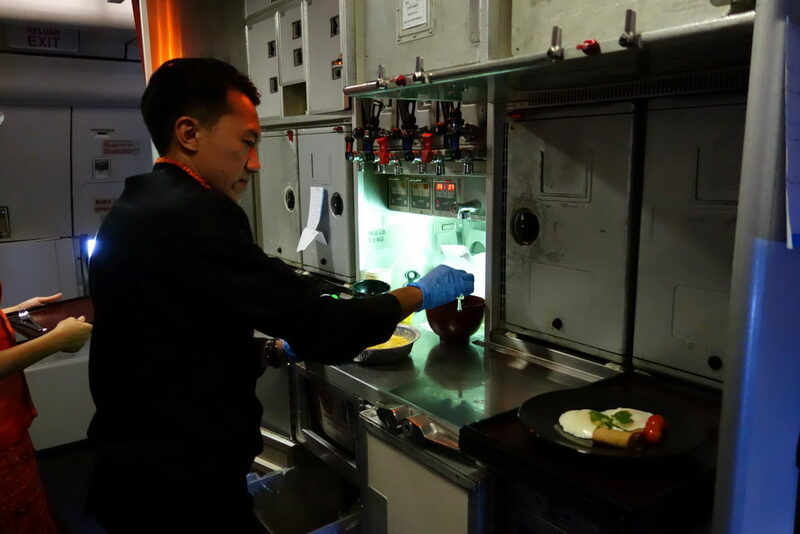 We were lucky to witness our flight’s on-board Chef, Mohammed Pindo in action. This is him preparing poached eggs just before breakfast service. You can also see all this in the video above. Since the beginning of 2015, Garuda Indonesia had really kicked up their service and product levels in full gear. 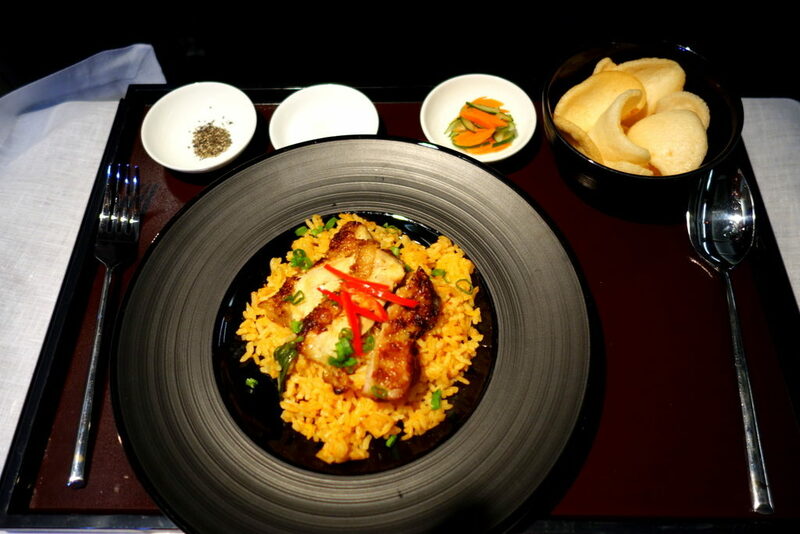 One of their many additions to the service is having an On Board chef on their mid to long-haul flights. This is to ensure that the quality on their first and business class meals are top notch. They also take certain requests like eggs cooked any way you want, among many others. You can read all about Garuda Indonesia’s extensive journey to becoming an award-winning airline. 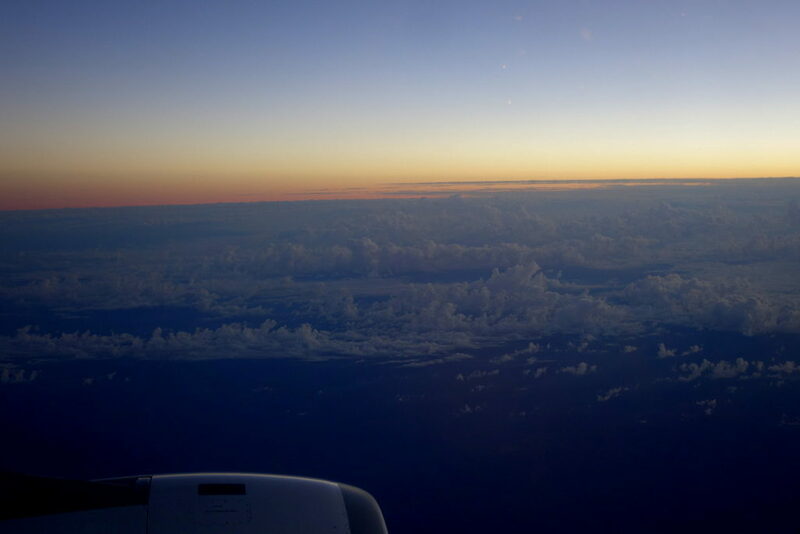 Service was very warm and personable, which is always welcome on a late evening flight. With the flight departing at 10:30 PM which is the end of the day for most passengers, it’s always refereshing to be with crew who have sunny dispositions. The cabin manager, Johan Muliate was extremely accommodating. There was a slight glitch on their entertainment system (it had the option of being able to read passengers’ USB sticks but eventually didn’t work) and we just queried this just to see if we were doing something wrong or not. And Johan immediately went to test other seats’ USB reading capabilities and later confirmed to us apologetically that this service is still not functional. We were absolutely fine with it, and I was really impressed with how Johan attended to the issue (which is a non-issue really). I got to chat with him and learned that he is Bali-based (the Garuda Indonesia crew for flights out of Bali are normally based in Bali), so he is thrilled because Garuda is expanding their international flights out of Bali. He’s worked 22 years with Garuda Indonesia and his favourite destinations are Sydney, Seoul and Osaka. This is what Zombie chose and as you can see it really is a hearty breakfast meal. I love the small details in the food tray like this cone shaped mound of rice. This is what I chose. And I originally just wanted to have the museli but they were out of it, so I had the panckaes and yogurt instead. 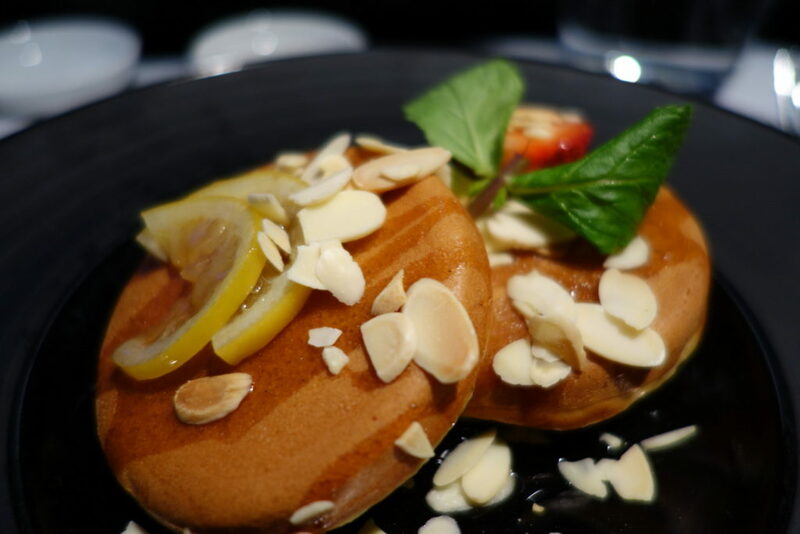 I like that the pancakes were not humongous and they were firm. I eat very little breakfast (if at all) so this was a very good portion for me. This was a really enjoyable flight, one of those flight experiences where you wish could last longer (flight was less than 6 hours). Very recently, Garuda Indonesia ranked 8th in the World Airline Awards by Skytrax (10 Best Airlines in the World). In my opinion they really do deserve to be in Top 10 and if they continue to consistently give this kind of service onboard, I can imagine them very well easing into Top 5 in no time. If I am to be finicky and really probe hard to see what can be improved overall, it would probably be the boarding service as both in Sydney and in Denpasar airports, the boarding times were both slightly delayed. 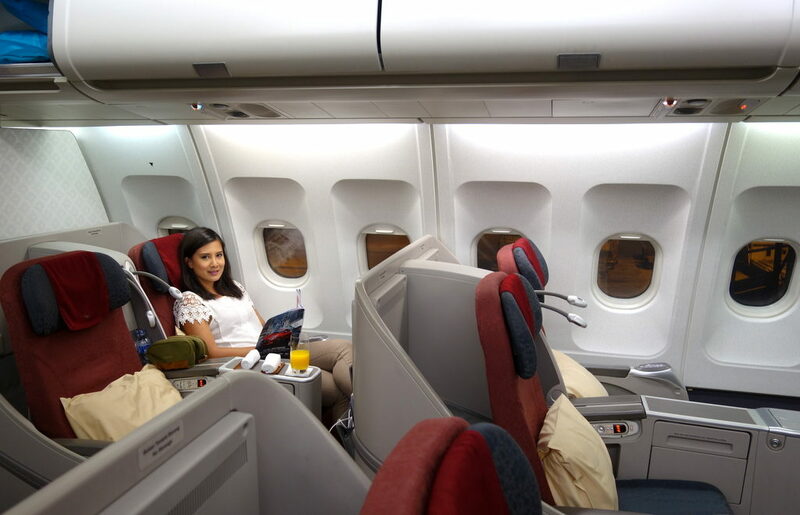 I will no doubt fly Garuda Indonesia again in the future and am curious how they fare in long haul flights to Europe. 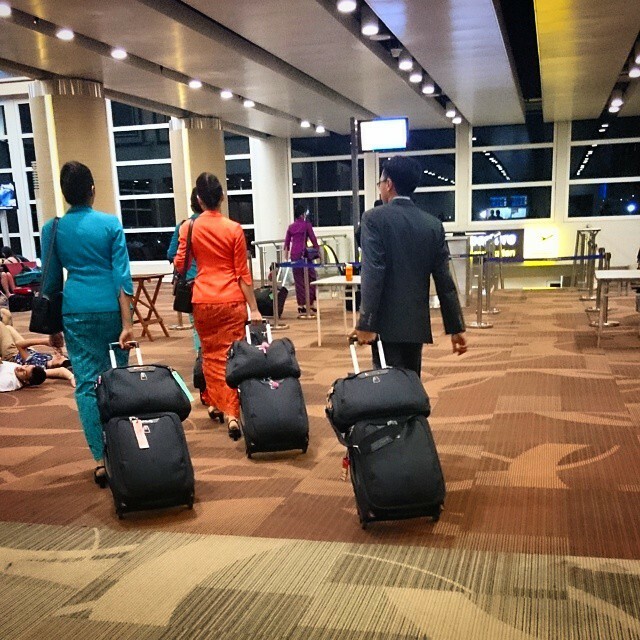 Have you flown Garuda Indonesia before? How was the experience? We flew as guests of Garuda Indonesia, however all opinions and thoughts are my own. Great review! I am flying them in September for the first time and can’t wait. Wondering if the seat map is different than what is shown on SeatGuru though? I will be on the A330-300 as well and they assigned me to 6A. I see you were in row 12 which SeatGuru shows is in economy. GA recently has completed seats re-numbering across all cabins on all aircraft types.First class starts from row 1,Business class starts from row 6 and Economy class starts from row 21 onwards. Wow Julian Thank you so much for that added piece of vital information! 🙂 For a while there I was in a twilight zone thinking if my mind was playing tricks on me! We flew Garuda from London – Bali (via Jakarta) last year and from Bali to Sydney. The service was awesome even in economy and surpassed our expectations. The crew were friendly and attentive, the in flight entertainment was great and the food was delicious, way better than any other airline food I have eaten. Next time I fly, Garuda would be my first choice. 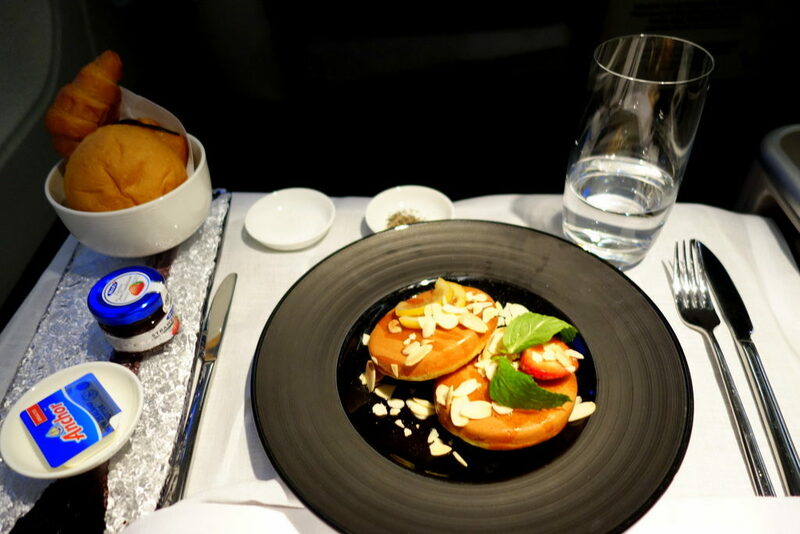 Nope, never flown with Garuda Indonesia, but they look pretty great, especially the food selections.